We specialise in Triathlon Coaching and as a Triathlon coach we will help you achieve your goals. Swimming, cycling or running coaching is personal to your needs. Our coaching programmes and plans combined with personal training mean we can cater for your individual goals and objectives. We are based in the North Easy and cover Newcastle, Northumberland, Durham and Cumbria. Some examples of what some of our athletes say about us. At the end of 2010, I sought help from Tri4u to help me achieve my goal of obtaining GB age group qualification during 2011. I met with Barry Jameson and we planned a strategy for the following year targeting four GB qualifying races in various parts of the UK. Barry then provided a comprehensive training plan geared specifically to my needs and available time. The programme told me on a daily basis when to train, for how long and at what intensity. It incorporated existing club sessions. It was easy to understand and follow. I reported back on a weekly basis and we met regularly to discuss progress and review the plan. I came from a running background having competed for Richmond and Zetland Harriers and the county since the age of 13. Although I was enjoying running the cross country and athletics scene, I was plagued by injury and for 4 recurring years I found myself in a constant cycle of physiotherapy and recovery. This was frustrating at the best of times, so I knew something had to change. A good friend introduced me to triathlon, so I gave it a go and really enjoyed it, thinking “finally I’ve found the sport for me” winning my age group in my first competition. I decided I wanted to take it more seriously and after competing at the Teesdale Triathlon I met my now coach Phil and his dad Barry, I signed onto the Tri4u training programme in May 2011. Since starting the programme I’ve had nothing but committed professional expertise from Phil, with his breadth of knowledge and his own experience at international level it makes him second to none. What is most important in any coach-athlete relationship for me is trust, and I trust Phil to help me make the right decisions to reach my goals. I can confidently say that without Phil I wouldn’t have the confidence, be the triathlete or be representing the Great Britain Team competing at the European Championships in Israel 2012. From a complete novice at the start of the season to becoming a member of the Great Britain Team at the end, I think that is testament to the quality of coaching you can expect to receive from Tri4u yourself. We all have ambitions, some “pie in the sky”, others more achievable. Mind you, if you’d asked me 5 years ago when I couldn’t swim a length in front crawl I would have said Ironman was “pie in the sky” for me – it just goes to show how wrong you can be. I loved triathlon from the first try a tri I competed in. The swim was done in bad breast stroke because I couldn’t do anything else; the bike on a very heavy girly pink mountain bike and the run, well, no one had ever told me how you feel after jumping off a bike and running, so that was a very new experience! I know now you have to practise that! Since then I have trained in all “four” disciplines and although I’ve competed I’ve never stepped up the game and done anything further than a sprint distance. I’m still a slow swimmer, it’s done in front crawl now though, and the biking and running, well their OK. However, last year a few from the Tri Club decided they were going to Roth. An ironman distance on the world’s fastest course – it’s flat they said. They also never mentioned that the cut off is 2 hours less than most other ironman distance races. Having mentioned the idea to my husband to see what he thought, the next thing I knew I was entered and suddenly ironman became a big reality. I knew I could ride over 100 miles in one go and I’ve covered the marathon distance a few times before, but, 3.8K swim. That was an altogether different baby. Undaunted I started on my training 30 weeks before the big day. I decided to follow the “just get round” swim schedule and the intermediate bike and run schedule. Anyway I’d paid my entry fee and people knew I was entered so there was no going back. In April I went to Italy to a triathlon training camp coached by Tri4U coach Philip Jameson. Early morning swims in the freezing cold sea and experiencing swim sessions in the 50m pool plus those endless Italian hills certainly helped with the endurance training. On my return I invested in some private swimming lessons with Philip to help my technique and attended a number of open water sessions with Barry and Philip. This really helped me, not only from the invalueable coaching but also psychologically, because they believed I could achieve it aswell. So there you have it on Sunday, 18th July 2010 I amazed myself and completed the ironman distance course with 30 minuntes to spare from the cut off time. I swam 3.8K in open water, biked 180k on a course that was not as flat as I was led to believe, and walked/jogged my way round the 42K run, having not done any substantial run training since April because of a stress fracture. I was an emotional wreck at the end, but I knew I would be. From sprint to ironman in 30 weeks – it can be done – cause I’ve done it!!! After signing up for a triathlon I decided I needed some help about starting in triathlon. I met with Phil from Tri4u after being recommended by a friend and he talked me through different options which would be appropriate to me. He suggested I attend a training day which was at Wentworth Leisure Centre in Hexham. I was nervous going into the day but straight away was made to feel at ease and comfortable. Throughout the day we did swimming, cycling, running, transition and even had talks regarding nutrition and how to train effectively. That day was excellent and I would recommend it to anyone looking to have a fantastic day and learn many new things by some great coaches. I also then attended some open water coached swimming sessions which gave me an increased confidence. I completed my first triathlon in late 2011 and I can honestly say that without Phil, Barry and Judith I would not have enjoyed me experience anywhere near as much as I did. I have signed up to some events already for 2012, this time without any alcoholic influences. I would recommend anyone to work with Tri4u and look forward to re attending some coached sessions next time. I first met Barry in 2009 at a talent ID day when Barry was Head Coach of the Regional Triathlon Academy. Barry coached me in my first season of triathlon 2009 as a T2, to acheive a bronze medal at the Inter Regional Championships at Park Bryn Bach, Wales. 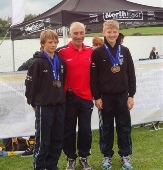 Since then Barry has continued coaching me and after a very successful season 2011 as a T3, i again acheived a podium finish with NE Region team mate Jack Willis, who Barry also coaches, at the Inter Regional Championships 2011, Hetton Lyons Country Park. Barry's training is awesome! hard work but made fun which is an important part of training. Barry is always supportive and encouraging to all athletes regardless of ability, and it was Barry who helped me back to fitness after an injury last year. I am and will always be indebted to you Barry, i can't thank you enough. Jordan now races in the Junior Elite series with other athletes we have worked with, Jack, Bronwyn and Kate. 1. That you have a mentor who has been there and done it himself. He is ready with advice and encouragement about all aspects of triathlon from technical advice to practical tips on how best to prepare for races. 2. That the planning and thinking is done for you. All you have to do is the training and the racing. I achieved qualification to represent G.B. in all four races, winning my age group in two and being runner up in another. I believe I have won the regional Grand Prix after winning my age group in five local triathlons. 2011 has been a very successful season for me and that is thanks in no small way to the help and assistance which I received from Tri4u. We didn’t really know what to expect but we loved every minute. It was professionally organised but still had a friendly family feel about it. Going home feeling more motivated and greater understanding of training. Lovely atmosphere and Barry and Phil are great coaches. Just Brilliant ……. Another triumphant year. Your professional coaching gave me confidence to complete the Great North Swim. Just want to thank you both for such a great day yesterday. OK, so I'm not going to be entering a Triathlon any time soon (!!) but I learned a lot about Open Water swimming and I picked up some useful tips about my swimming stroke. Your good planning (even down to the 20ps for those essential hot showers) meant that I had no excuses for NOT focusing on my swimming! The sunny weather, beautiful surroundings (Askham outdoor swimming pool is a real hidden treasure and Ullswater is just lovely) and friendliness of the group, were a bonus. However, what made the whole experience so enjoyable for me was your joint leadership of the programme, this was a rather steep learning curve for me. Not once did I feel unsafe or stupid. You both consistently offered positive reinforcement and I felt really safe. So, many thanks. Just wanted to say thank you for your help and advice over the last ten months that helped me to do the Ironman. I loved it, it was an incredible experience and am so pleased I completed it. I feel great afterwards too.